IBPS Clerk 2017 Notification: Institute of Banking Personnel Selection (IBPS) has released the notification for filling up 7883 vacancies for this fiscal year. The official notification regarding Common Recruitment process for recruitment of Clerks in Participating Organizations (2018-19) was issued today by the Institute. The candidates who are interested and are planning, this is a better chance to do it. The online application process will begin on 12th September and will be closed on 3rd October. 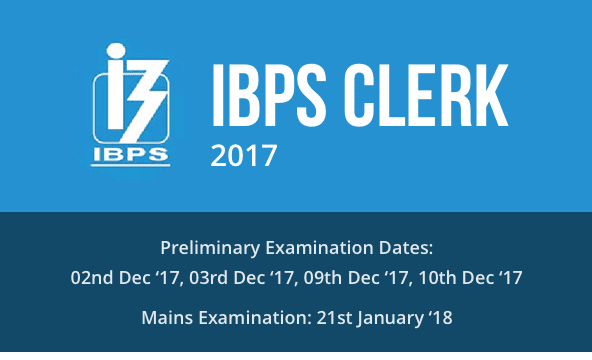 The IBPS Clerk 2017 notification is available on the official website of IBPS in the form of PDF. The number of vacancies has decreased from the previous year. The vacancies have decreased by more than half as they were 19,243 in 2016. Educational Qualification: A candidate must have a graduation degree in any discipline from a recognized University or any equivalent qualification recognized as such by the Central Government.The candidate should have passed in English as one of the subjects at SSC/ HSC/ Intermediate/ Graduation level. The applicant must possess a Graduation degree in any stream from a recognized University in India. The age limitation falls between 20 years to 28 years. Application Process: The application process will be done via online mode on the IBPS official website. The application fee can be submitted via online mode from 12th September to 3rd October. The registration process is simple. To register online you have to log on to the official website of IBPS http://www.ibps.in/cwe-clerical-cadre-6/ by entering in the requisite details. Once the form is filled, you will be redirected to an online payment gateway where you can pay the registration fees via net banking or credit/debit card. The online Preliminary exam will be held on 2nd, 3rd, 9th and 10th December and the result will also be announced in December.The provisional allotments will be done in the month of April 2018 on the basis of final vacancies reported by the Participating Organizations.